Cyprus is known internationally more for ship owning than boat building, but the country was producing boats before Euclid drew his first triangle. Nowadays they build them in fibreglass, and are confident enough in them to give a ten year hull warranty. Locally they are imported by Searano Marine, the recently established Malaga dealership. 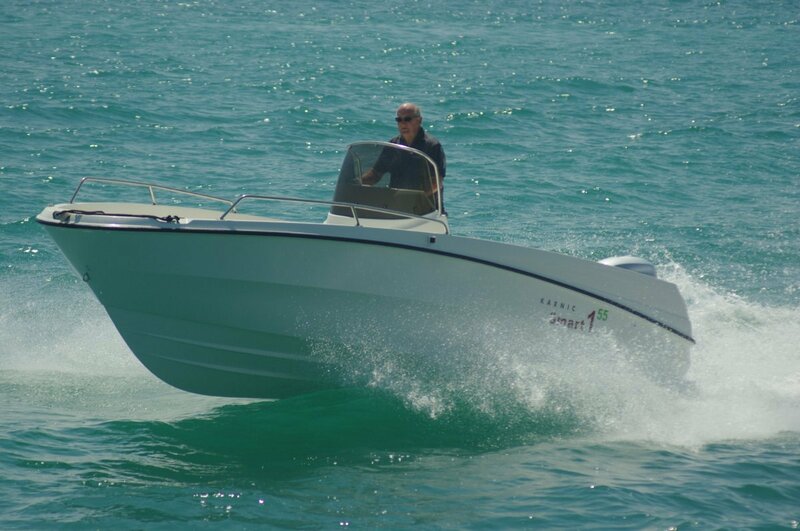 The review boat is the baby of the range, the 5.5 metre Karnic Smart 1-55. A stylish centre console, by current fibreglass standards it is perhaps on the stark side. For instance, there was no seat at the console. On the other hand many centre console drivers prefer to stand full time, and its absence makes a distinctly roomy boat. The only hand holds for the driver and anyone else at the console are provided by the windscreen surround, which is a reassuringly rigid structure. Options do include a swivel or bench seat, and passengers are provided with a bench right aft as well as the bow seat. As with many imported boats the builders assumed that no one would want to anchor it. Where any Australian-built boat bigger than a dinghy would have bowsprit, bollard and anchor well, this has a couple of cleats. However rope and anchor could be stowed in a locker under the bow seat and, of course, not everyone anchors often enough to be picky about the ancillaries. The Karnic offers more flexibility of layout than is usual in a fibreglass boat. The standard wideish centre console can be replaced with a smaller item, with or without a seat ahead of it, or it can be mounted as a side console; a casting platform can be added. Consoles and steering gear can be deleted, resulting in a hull to suit tiller steering selling for $16,000. The Karnic’s strong point is its ability to absorb gear. Under deck compartments soak up scuba gear, fishing rods and picnic equipment with ease. Wing tanks can handle ice and catch. The console and a transom locker take care of anything else. The review day featured a rapidly building sea breeze creating a short, steep sea. We were able to use this to put some stress on the hull’s abilities. The Karnic showed up pretty well. The hull has plenty of shape, an 18 degree deadrise and good freeboard, all of which give it a good start. That freeboard combined with OK stability gives it the steadiness and security at rest a fishing centre console needs. Under way the shape and deadrise do their jobs well: ride is average or a touch better for the length. There is the bonus of quietness from the fibreglass construction, and this combined with a notably hushed motor to add peacefulness to the performance. Power came from an 80hp Honda. The boat is well capable of using more power, but an 80 probably produces the right balance between performance, economy and cost. Cost is likely to be a consideration with most buyers: $38,000 as reviewed makes the Karnic attractive, although as the dollar sinks against the euro future imports could be dearer. The level of equipment is not high, but the advantage of adding items later is that you pay only for what you use. Interestingly, the lack of a Bimini is a Mediterranean quirk rather than an economy measure. The builder was baffled at the concept of sun protection – getting sunburnt is part and parcel of boating over there.